One really realises how lucky you are when every morning, you make your way down to the main area. And you are then greeted by an endless view of hills and valleys in front of you, and the morning light cascading across the undulating landscape and hills. As you peer across, you will often see herds of animals making their way across your field of vision. Herds of impala, eland, zebra and wildebeest often make their way from one side of the plain to the other, and in the heat of the day, elephants and other species enjoy the shelter and shade of the tall trees in the Riverine forest in the valley below. Often as you peer across, you can find a tower of giraffe, all huddled under the umbrella shaped Tamarind tree, which the giraffe have so perfectly trimmed, forming a straight browsing line. And this is all from the comfort of a chair in the main area, or even from the view of the banda’s at Beho Beho. In the evenings everyone sits, with drink in hand, eyes constantly watching for any passersby, who may stop at the water hole in front of camp, for a refreshment break. A hippo, or an elephant maybe, even an African Civet may come and feed on the insects attracted by the light. One thing is for sure, that the perfect position of Beho Beho, makes game viewing from the luxury of camp worthwhile. 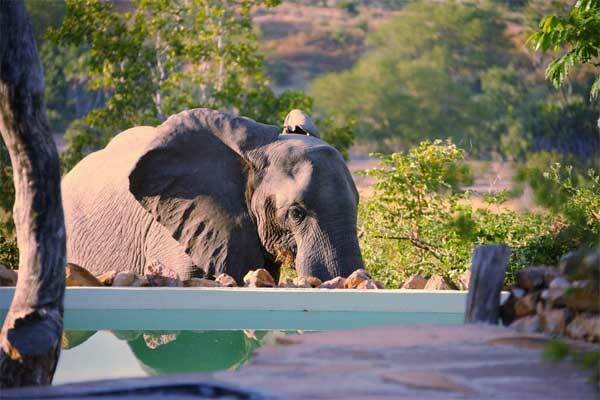 Often in the mornings, as the guides wait for their guests to join them on morning activities they are greeted by a trunk, or several trunks, as elephants walk past after feeding in camp that night; or like the other morning we were greeted from across the pool, by a young bull, peering across the water. Whether just checking if the water was good to drink, or even possibly contemplating to take a plunge, one can only imagine what was going through his mind as he filled his mouth with another tussock of grass. One can only take in a deep breath, and sigh a grateful relief, that we are here in one of Africa’s wild and beautiful places. This entry was posted in Walter, Wildlife and tagged Beho Beho, camp, elephant, safari, selous. Bookmark the permalink. Walter, we miss you and Karin. Hope to make a return trip to see you next year 2014. Ps is Onesmo still at beho?